Hooray! It’s Friday! 🙂 For today’s post, I will be sharing swatches of Frenzy Polish‘s Gamer Girl Collection! Yes that’s right… a whole collection that is based on gaming! This collection consists of 12 polishes and is releasing tonight, 6/5, at 8pm EST! All swatches were taken indoors using a combination of Cree daylight and LED bulbs. PWN’d by a Girl is a neon pink crelly with blue micro shimmer. Shown here is two coats plus top coat. It dries to a semi-matte finish so a top coat is recommended. I love the subtle shimmer throughout this polish! Thanks to laptops this is now much easier but I actually remember everyone bringing their monitors, towers, keyboards, and mice and getting our game on all together in the same room. Bring on the snacks, the Mountain Dew, and let the fun begin! 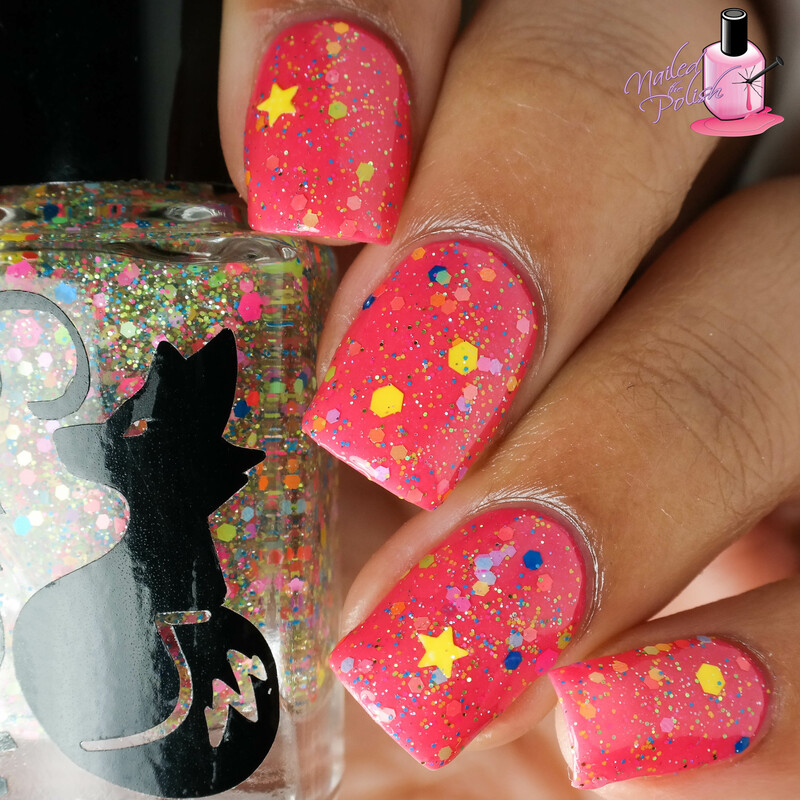 LAN Party is a fun glitter topper full of neon glitters of various sizes and shapes along with neon yellow stars and scattered holo micro glitter. Shown here is one coat over PWN’d by a Girl with top coat. I don’t know about you but this totally reminds me of the Mario game series! I did have to fish for the stars since they are random but all others came out fine. Great glitter to base ratio and it applied very smoothly! During those long raids, it’s sometimes necessary to take a 5 minute break, raid the fridge, and grab a drink! AFK is a neon yellow slightly lime crelly with gold shimmer, green glitter, and copper/green metallic flakies. Shown here is three coats plus top coat. This polish has such a great formula! It is a bit sheer though so I think it would do well over a white base and would make it a little more neon. Out of mana and yet the tank just keeps on pulling adds… Ugh! OOM is a beautiful light blue creme with violet and red shimmer. Shown here is three coats plus top coat. This polish was very easy to apply but caution – it has an extremely fast dry time! My first coat was a little thin so it dried before it could level out and I ended up with slight waviness throughout my nails. I would recommend to have a little more polish on your brush than usual to avoid this. GG is a white creme packed with silver and white micro flakes and multi-colored shifting iridescent micro-glitter. Shown here is three coats plus top coat. I absolutely love the flakes and micro glitter in this polish – makes it so unique and you know I love me some unique polishes! FYI, this polish is also very fast drying so my advice above applies here as well. More Pew Pew, Less QQ is an olive tone brown scattered holo. Two coats plus top coat. Great application! I can easily say that this is a shade I don’t own – Very camo-esque! Oh wait… I forgot to mention one thing. More Pew Pew, Less QQ is a scattered holo THERMAL polish! 😀 It’s the shade above when cold and spring green when warm! And just cause… here’s a transition macro! Lagfest is a grey crelly filled with pink, purple, and black glitters of different shapes and sizes plus violet shimmer. Pictured is two coats plus top coat. Rachel, you’re starting to turn me into a crelly fan! The formula here is amazing! There’s the perfect amount of glitter so that it scatters just right onto the nail during application. Two thumbs up! EPIC is a medium purple creme packed with multi-colored flakies. Shown here is two coats plus top coat. UH-MAY-ZING formula! The flakies in this polish are to die for! This polish is definitely EPIC! For when you’ve had enough of fail tanks and people who stand in bad, sometimes you just have to toss the controller/keyboard and /ragequit! 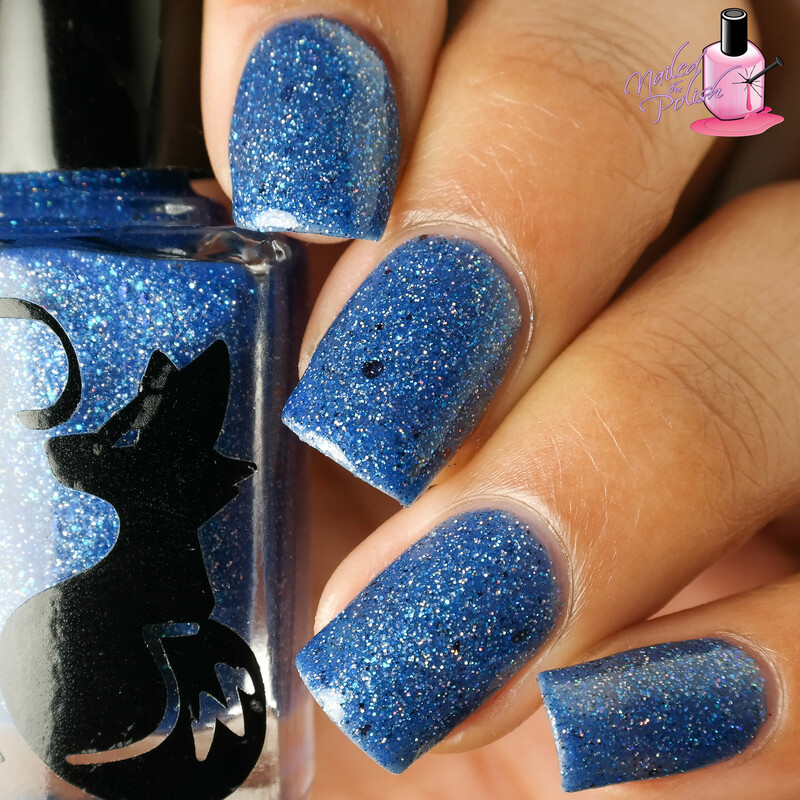 Blue Screen of Death is a slightly tinted blue base with loads of blue glitter, sparse black glitter, and flashes of light blue and holo glitters. Shown here is two coats plus top coat. Nice formula and great dry time. This polish is so pretty and I love the added black glitter. And as an added bonus, Blue Screen of Death glows in the dark! Fatality is a brown scattered holo with added red glitter and a slight red shift. Pictured is two coats plus top coat. I am obsessed with this polish! It made me realize that I didn’t own any brown holos and now that I think about it, there really aren’t many out there! Not only is this polish beautiful but the formula and coverage is great. This polish totally deserves a fancy shot! Last up is Wanna Role Play? – a teal scattered holo. And just like More Pew Pew, Less QQ, it is also a thermal polish! Shown here is three coats plus top coat. The formula is a little thinner here requiring an additional coat but you won’t even care because everything else is so amazing. Application, dry time, control – all top notch! My absolute favorite from the collection! Wanna Role Play? is teal when cold and silver when warm! What I love about Frenzy Polish is how thought out their collections are. From the names, to the descriptions, to the polishes themselves. Their collections encompass their given themes so well yet each polish is distinctively different from one another. I am constantly impressed with this brand! No major issues with formula or application and all polishes are unique to my collection (there are a couple that are similar… but of course not the same lol). My picks would be Wanna Role Play?, Fatality, /ragequite, and EPIC. But like I’ve said before with Frenzy Polish, you won’t be disappointed with any polish that you choose! This collection is releasing tonight at 8pm Eastern and will be available for purchase here. Prices range from $7.50 to $8.00. Also available for purchase are select shades from their Spring Collection – you can check out my swatches and review of Part 1 here. Be sure to check out Frenzy Polish on Instagram and Facebook for more photos this collection! What are your thoughts on this collection? Will you be picking up any during tonight’s release?